That moment where you have a craving for a homemade chocolate cookie and do not want the hassle of measuring. 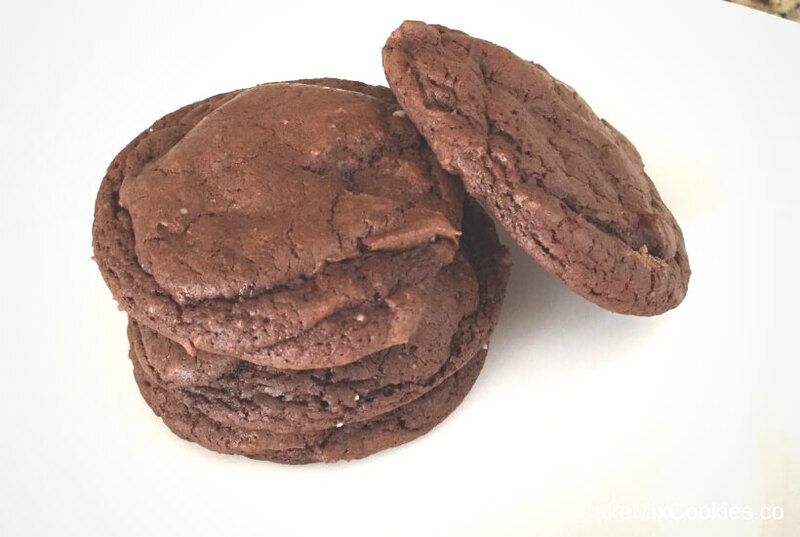 Chocolate Cake Mix Cookies are great way to fill that craving with little time and effort. Using chocolate cake mix as a starting point saves you steps as well as means you need to have fewer ingredients on hand. 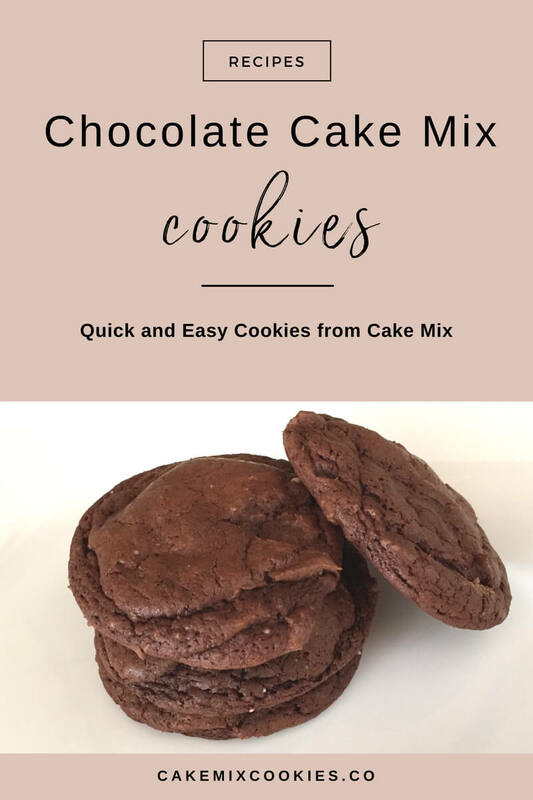 Chocolate cake mix cookies are also budget friendly if you purchase boxes of cake mix on sale. 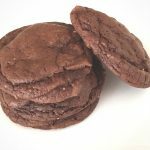 This chocolate cake mix cookie recipe is quick and easy, requiring only 3 (or 4 ingredients) to bake 24 cookies. And you can also make this your own by including add-ins such as chocolate chips or rolling in powdered sugar for crinkle cookies. Shhh, I won’t tell your secret. Usually the dough is very stiff so use a sturdy bowl when mixing. Or in cases where the dough is a little more gooey, and difficult to roll into balls, try refrigerating it for 30 minutes before baking. Sometimes different cake mixes will have different results. My preference is Dunkin Hines Devils Food for a tasty chocolate cookie..
Line your cookie sheet with parchment paper or a silicone mat for easier cookie release and cleanup! The cookies may look a little extra puffy when they first come out of the over. They’ll settle down while cooling. As with other cookies, cake mix cookies will also freeze well if you’re making a large batch to eat later, or take for lunch! Crinkle cookies are made by rolling balls of cookie dough in powered sugar before baking. You’ll need about 3 or 4 tablespoons. Very easy to create a fancier looking cookie. Try different types of cake mix, such as Red Velvet. Most cake mixes make for great variations and combinations. Stir in baking chips (chocolate, white chocolate, etc), nuts, dried fruit to make different cookie variations. For one box of cake mix, use at most 1 cup to add-in total otherwise your cookies won’t hold together. Yes, there is such as thing as too many chocolate chips. Whisk together the 2 eggs, oil, and vanilla extract (if using). Add the wet mixture with cake mix and stir until dough forms. Note: this will probably be a fairly stiff dough so use a large sturdy bowl. Use two tablespoons or a cookie scoop to create 1-inch balls of dough. If it’s too sticky or difficult to manage, chill the dough for 30 minutes before baking. Place on ungreased cookie sheet leaving about 2 inches between cookies. Tip: line your cookie sheets with parchment paper or a silicone mat for easy cookie release and cleanup. Bake 9-10 minutes, until set. Remove from oven and wait for about 5 minutes before removing the cookings to a cooling rack. The cookies may be a little puffy coming out of the oven and then will collapse while cooling. For Crinkle cookies, roll each ball in powdered sugar before putting on the cookie sheet to bake. You will need about 3 or 4 tablespoons of powered sugar for this. Create a signature cooking by stirring in a cup of baking chips, nuts or other dried fruit. Keep it to about a cup total otherwise you’ll have more add=ins than dough to hold your cookies together. Hi my name is Cara and I love cake mix cookies. The first time I made them was when I was in middle school. Years later I tried to find the same recipe, lost in my boxes of memories. I created this blog to share my cake mix cookie experiments with you. Welcome to Cake Mix Cookies!